The Cancer Survivor’s Guide: Foods That Help You Fight Back is written by Neal Barnard, M.D, bestselling author and advocate of a plant-based diet, and Jennifer Reilly, a nutrition consultant for The Cancer Project. While the recommendations in this book cannot be regarded as a treatment for cancer, it has been observed that certain dietary patterns appear to have a major benefit and help people who have been diagnosed with cancer to live longer and healthier lives. One of the most important findings is that diets high in fiber and low in fat tend to reduce the levels of hormones that are involved in the growth of cancer cells. Evidence also suggests that populations consuming low amounts of meat and dairy products display a lower incidence of cancer. Due to this research the major principle outlined in The Cancer Survivor Guide is to emphasize low fat, high fiber foods such as vegetables, fruits, whole grains and legumes. You are advised to strive for an intake of forty grams of fiber a day. There are also certain foods that are recommended for their high levels of antioxidants and specific immune-boosting compounds. Predominantly these include vegetables and fruits. Studies suggest that diets rich in vegetables and fruits reduce the likelihood that cancer will develop in the first place and that cancer survivors who consume more fresh produce live longer cancer-free lives. Fruits and vegetables provide a variety of protective compounds such as beta-carotene, lycopene, vitamin E, selenium, vitamin C, zinc and phytochemicals. The Cancer Survivors Guide also includes information about foods that interfere with immunity and should be avoided including animal products that are high in fat and cholesterol. Maintaining a healthy weight reduces the chance that cancer will develop and may also improve survival after cancer has been diagnosed. However, it is not recommended that you cut back on your portion sizes because this can trigger hunger, leading to binges and rebound weight gain. Instead you should focus on healthy foods that are naturally low in calories, which is easy to achieve if you build your daily meal plan around vegetables, fruits, whole grains and beans. Kale, collard greens, broccoli, cabbage, tomato, carrots, cantaloupe, mango, figs, blueberries, garlic, onions, almonds, soy milk, oatmeal, brown rice, pasta tempeh, chick peas, refried beans, mushrooms, nutritional yeast, seitan, maple syrup, herbs and spices. Exercise burns calories, boosts metabolism, strengthens the bones and reduces stress that can lead to overeating. The Cancer Survivor Guide recommends that you start slowly when you begin exercising with a brisk walk every day for half an hour or three times a week for an hour. However, even those who are unable to exercise due to health limitations will still be able to lose weight just by following a low fat plant-based diet. 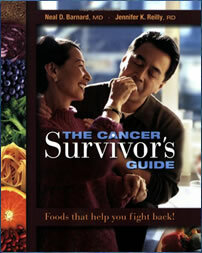 The Cancer Survivor’s Guide: Foods That Help You Fight Back retails at $19.95. A low-fat, plant-based diet may reduce the risk of developing cancer and increase survival rates in those already diagnosed. Includes specific information about foods and breast and prostate cancer survival. Provides cancer patients with a way to become proactive in their recovery process. Includes recipes designed specifically to reduce the risk of cancer. Authors are experts in the field of preventative nutrition. Very restrictive and eliminates many foods including all animal products. Some dieters can experience digestive disturbances such as gas and bloating when initially increasing their intake of fiber. Will probably require more time to be spent preparing meals. The Cancer Survivors Guide doesn’t include a meal plan. Some of the dessert recipes contain refined sugar. The Cancer Survivor’s Guide explains how the foods we eat can influence the risk of developing cancer as well as assisting in maintaining the health of people already diagnosed with cancer. The program outlined in this book should not be regarded as a treatment for cancer but scientific studies suggest that this way of eating is an important component of a cancer-preventative lifestyle.